Victoria Haddock, the second in a series of interns working on the Thomson-Walker collection, reviews her time spent at the CRC in this week’s blog post. If you’d like to find out more about this project, you can view Victoria’s end of internship Powerpoint presentation at the bottom of this article. As I watch another beautiful sunset from the window of the CRC conservation studio, it seems a good moment to reflect back on the past 10 weeks of my internship here, which have absolutely flown by. Although I did think on my first day that I was looking forward to 10 weeks of solid tape removal, the internship has been very busy, varied and with lots of opportunities beyond what I first expected. I’ve been able to go to different conservation studios in Edinburgh such as the National Library of Scotland and National Museum of Scotland and visited the Glasgow Museums Resource Centre and the Textile Conservation Centre, Glasgow on a visit organised through the Icon Ethnographic group; as well as attending events and lectures organised by the Icon Scotland group such as the annual Plenderleith lecture. Back at the CRC I’ve helped during studio tours explaining my project to visitors and assisted Emily during the conservation taster days, although demonstrating tear repairs in front of an audience was slightly daunting! It’s been a really great experience being here, and I’ve felt really welcomed in as part of the conservation team and learnt a lot just from being in the studio. I’ll definitely be taking with me the sense of professionalism and communication the conservation team have with each other and with the wider CRC department. The project itself has been a great experience in multi-tasking and not wasting any time whilst waiting for the poultices to work and getting into a system that allows the majority of objects to be treated in a short time. It has also, for me, highlighted the transient nature of being an intern and the challenges of having to carry on work previously outlined by someone else, and has made me realise how important clear and detailed documentation and guidelines are – and to also explain not just what to do but say why certain decisions have been made for these projects. 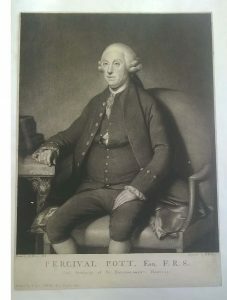 My favourite prints which made me chuckle were these two of Sir Percivall Pott (1714 – 1788), one by Joshua Reynolds (1723 – 1792) and one by Nathaniel Dance (1735 – 1811). Same man two very different perspectives – one suave and sophisticated and the other … well we know now who ate all the pies – I wonder which portrait Percivall preferred?! TW.1.P43. Sir Percivall Pott. By Joshua Reynolds. TW.1.P44. Sir Percivall Pott. By Nathaniel Dance. Another interesting find was not one but two female portraits amongst the 1000 prints looked at so far. 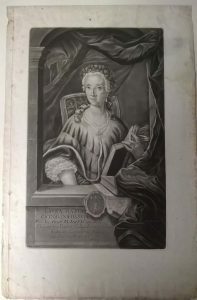 Unfortunately I cannot find much more information about Mrs Morris (a midwife), but the other portrait of Laura Maria Catharina Bassi (1711 – 1778), an Italian physicist and academic, has a fascinating biography. TW.2.B1.23. Laura Maria Catharina Bassi. During the 10 weeks, I’ve managed to work through around 700 prints, bringing the total completed to 1084 – but this is still not even halfway through the whole collection. We finally counted the remaining prints and there are about 200 more prints in the collection than previously estimated bringing the total to 2700 – so good luck future interns you have still got a lot of work to do! 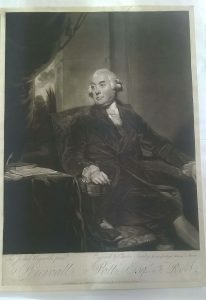 This entry was posted in Internships and tagged CMC poultice, internship, medical portraits, Thomson-Walker by conservation. Bookmark the permalink.